“Big” doesn’t quite cut it when it comes to describing the size and scope of Adobe’s Creative Suite 4 updates. With CS4, Adobe is updating its entire roster of high-end applications for print, Web, and video pros—13 apps in all, not to mention 14 integrated technologies and seven services. It’s a massive undertaking on Adobe’s part—and chronicling all these changes is almost as demanding. We’ve offered previews of the CS4 versions of Photoshop, Illustrator, InDesign, After Effects, and Premiere—and we’ve only just scratched the surface. Below, you’ll find brief overviews of seven more pieces of Adobe’s CS4 puzzle. Our reviewers highlight the major additions and enhancements in each app, as they prepare to evaluate the final releases of Adobe’s CS4 offerings when those programs begin shipping later this month. Flash CS4 features a radically revised animation environment. The stage—the application’s central workspace—has been moved to the top of the workspace, while the previously dominant timeline is tucked away beneath. 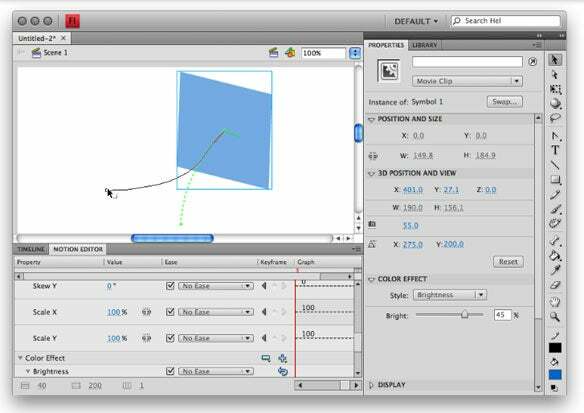 This rearrangement symbolizes and facilitates the real radical change in Flash CS4: a fundamental reconceptualization of the animation process. Flash CS4 moves the application’s central workspace right to top, tucking the timeline beneath the stage. Dreamweaver CS4 finally feels like part of the Creative Suite. The revamped interface now shares the look and feel of Photoshop, Flash, and Illustrator. In addition, support for Photoshop Smart Objects streamlines the preparation and editing of graphic assets for your Web sites. The related files bar, a new vertical split view, and live view to see the page as it actually looks (and works) in a Web browser are among the changes Adboe has already previewed in its Dreamweaver CS4 beta. For Web designers burdened by client requests to “change just one little thing” on their Web sites, Adobe is introducing a new Web-based service named “InContext Editing.” This service lets busy Web designers unload the mundane details of updating text and images on a Web site onto their clients (or coworkers), who can use just a Web browser to keep their site up to date. 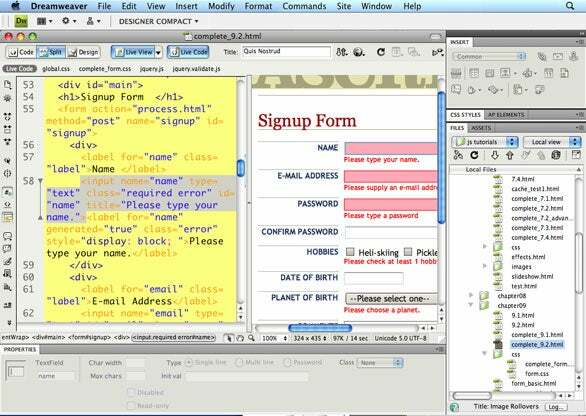 Dreamweaver CS4 provides tools for creating Web pages that work with InContext Editing. New features in Fireworks CS4 provide designers with advanced tools to create Web sites, applications, and interactive designs. Converting a design to a CSS layout-based Web page is a one-step process choosing the Export Menu and selecting CSS and HTML. The CSS options dialog window allows you to choose between writing CSS to an external file or in the html file. New Slice types provide the option of setting a background image for a Web page and repeating it along the X or Y coordinates. Improvements in the Styles panel include the default styles being subdivided into 13 sections making it easier to locate a style. The Auto Vector Mask command known as Fade Image in previous versions of Fireworks provides real-time previewing of masking as gradient handles are adjusted. Contribute CS4, a program that allows Web-unsavvy users to edit Web pages without the possibility of breaking the site, has changed little since the CS3 version. The biggest change is a new workflow process that allows the site administrator to require pages based on a particular site template to go through review and approval before they can be published. 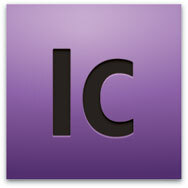 The CS4 upgrade to InCopy, the Adobe InDesign companion software that lets editors and designers work in layouts simultaneously, adds a number of new features, including the ability to share a screen with other users in real time over the Web, and to create hyperlinks and dynamic cross-references within InCopy documents. Two editions of Creative Suite ago, Adobe introduced a confusing technology called Version Cue that promised to do two things: let you track and manage versions of your files so you could revert to earlier versions if desired, and provide a shared workspace for all participants in a project to work on the files. If the Version Cue feature was enabled, Creative Suite applications had a second set of Open and Save dialog boxes meant to provide a unified experience across Windows and Macintosh, but one that didn’t work like the rest of your application’s Open and Save dialog boxes. In Creative Suite 4, that parallel universe of dialog boxes is gone. Version Cue is now much less visible to users of individual CS4 programs. Now, Adobe Bridge is where you manage Version Cue projects, creating virtual servers that appear on the Mac and Windows desktops like any other network drive. In programs like Photoshop and InDesign, you simply open Version Cue files from those network drives, and the programs understand that you are working in the Version Cue environment. That means the applications’ commands to check files in and out become available, and when you save your work by checking the files back in, the programs create a new version of the file, not replace the original. The original Soundbooth, which debuted with Adobe CS3, lacked features audio pros require in an audio editor. Soundbooth CS4 provides some of those features as well as supplies some intriguing new capabilities. 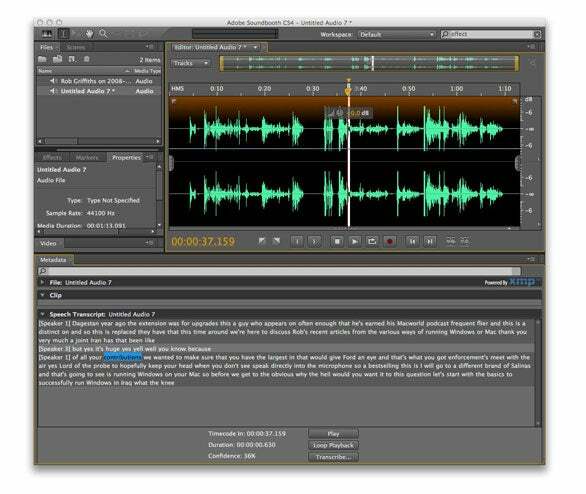 Specifically, the update brings nondestructive, multitrack editing to the program; allows you to add more than one AutoCompose score to a single project; lets you create restore points you can later return to; automatically matches volumes to balance loud and soft sections; and attempts to transcribe spoken passages in a project to text. You can then use that text to navigate through a project by clicking on words in the transcript. Adobe is packaging its CS4 updates into six suites. The $1,399 Design Standard suite features InDesign CS4, Photoshop CS4, Illustrator CS4 and Acrobat 9 Pro, along with new versions of Bridge, Device Central, and Version Cue. The $1,799 Design Premium suite features all of those apps (though it replaces the standard version of Photoshop with Photoshop CS4 Extended) and adds Flash, Dreamweaver, and Fireworks. Flash, Dreamweaver, Fireworks and Contribute make up the $999 Web Standard suite (which also features Bridge, Device Central and Version Cue). The $1,699 Web Premium suite adds Photoshop Extended, Illustrator, Soundbooth, and Acrobat to the mix. The $1,699 Production Premium Suite features Adobe’s video-editing tools—Premiere, After Effects, Soundbooth, OnLocation, and Encore—along with Photoshop Extended, Illustrator, and Flash. The $2,499 Master Collection features all of Adobe’s CS4 updates.